This week I had a terribly difficult time trying to find a new recipe which seemed appealing to do. 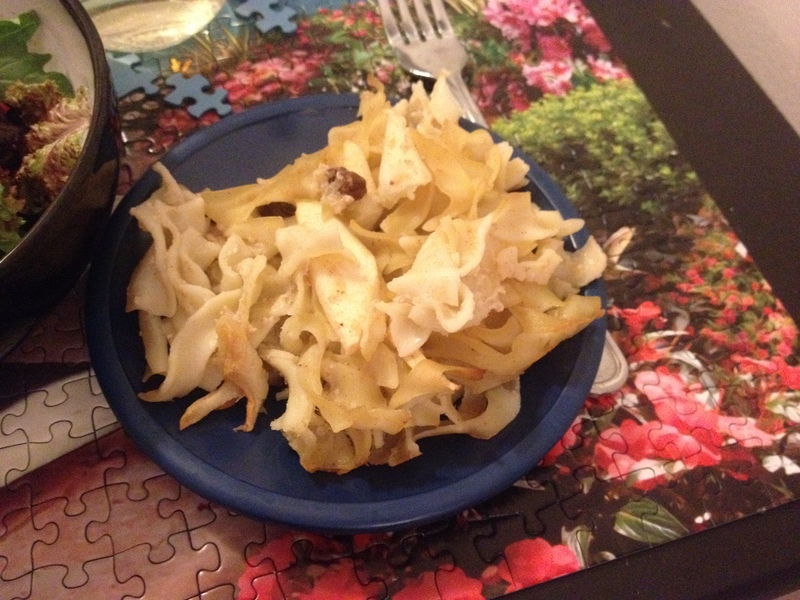 So I was talking it over with my BFF and she suggested I try making kugel, which I’d never made before, and sent over he family’s favorite recipe, which is for apple kugel. It looked pretty tasty, but going over the recipe I was like, vanilla, cinnamon, sugar, apples … wait a sec, is this a dinner dish or a dessert? She assured me it was a dinner dish, although suggested I pair it with something healthy, like a salad. Cook the egg noodles until just shy of al dente (or, if you are me, until they are done). Drain and stick back into the pot. Add the butter and let it melt into the noodles, stirring so all the noodles are covered in butter. Toss with the applesauce as well. In a large bowl, bear the eggs, egg whites, cinnamon, sugar, and vanilla. Add the apple, raisins, and noodles and mix the whole thing together thoroughly. Stick in a pan (I used both my 8X8 and my oval baking dish – this makes a lot). Now, the recipe said to cover, bake at 350 for 45 minutes, and then 15 uncovered at 375 for the final 15. However, I didn’t have aluminum foil, and didn’t feel like buying any, so uncovered at 375 for 30 minutes it was! Serve warm or room temperature. This was incredibly tasty, but I’m not convinced it isn’t secretly a dessert. It tastes like a dessert, noodles not withstanding. I had this with a green salad and a reisling, as I figured a slightly sweeter wine would work better (and it did!!) Also, this dish makes for an awesome breakfast the next day. Just a warning – the recipe makes a ton of food, so I’m hoping my BFF was right and it really does freeze well. Song of the Week: Sunday Morning by Maroon 5. For some reason this song just spoke to me this week. I had a ton of anxiety that I soothed by listening to this song on repeat until I was calm.